If you have been a fan of Vivien Leigh and/or Laurence Olivier for some time, you probably have a list of reasons why they appeal you. But if you’re a new fan, have just discovered this website, or are simply searching for answers as to why anyone would still be fascinated by two people who not only got divorced but have both been dead for over two decades, you’ve stumbled upon the right blog entry. 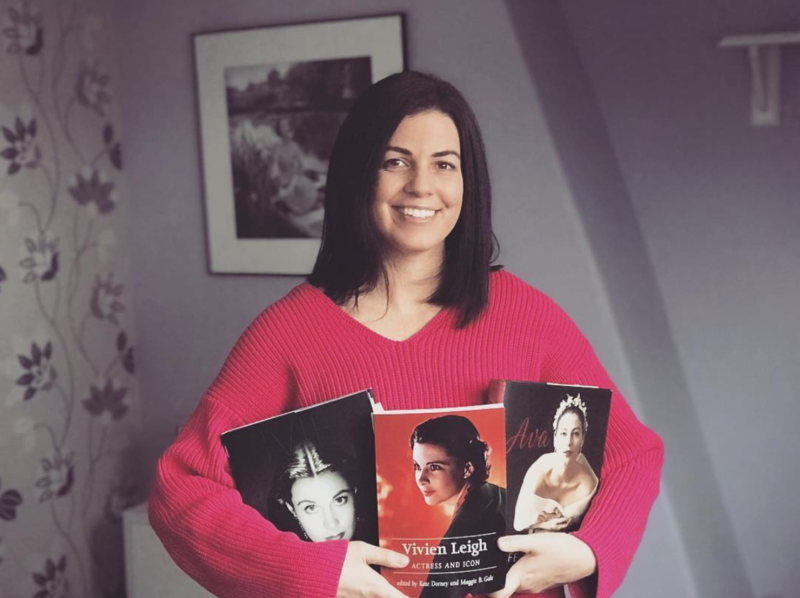 Here are 7 reasons why I adore Vivien Leigh and Laurence Olivier, and why you should give a damn, as well. Let’s get the obvious superficialities out of the way first. 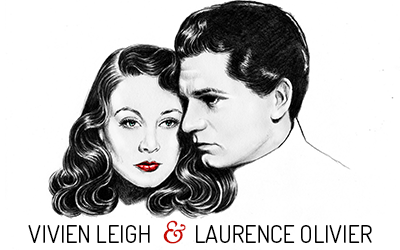 Vivien Leigh and Laurence Olivier were two of the most good looking people to have ever graced the silver screen or stage. If you’ve had a look through some of the pictures in the gallery, I’m sure you’ll agree. Vivien’s looks carried her to instant fame after her West End debut in The Mask of Virtue in 1935. Larry was a heartthrob who’s amazing bone structure and intense eyes captivated both men and women. Together, Vivien and Larry were a tour de force of beauty. Their natural attraction helped them gain legions of admirers around the world. Some stars have become synonymous with having amazing fashion sense. Take Audrey Hepburn and Grace Kelly for examples. The same was true for the Oliviers. When they became a couple, Vivien transformed him from casual to ultra-chic. He was seen in impeccably tailored suits from Savile Row, trench coats, fedoras, cravats. Even his casual wear was stylish. Vivien’s sense of style never left Larry. Although he reverted back to his previous style after their divorce, he continued to wear smart suits for formal business meetings. Vivien herself had impeccable taste in fashion. Always wanting to be on the cutting edge (and having the money to afford it), Vivien modeled for Vogue magazine for more than a decade and had many of her clothes personally fitted by top designers. Some of the clothiers she promoted through her modeling work as well as her personal fashion sense included Jeanne Lanvin, Pierre Balmain, Christian Dior, Elsa Schiaparelli, Edward Molyneux and Mainbocher. Even in austere wartime Britain, Vivien Leigh managed to look amazing. This was in part because she knew how to work a low key outfit. She also knew how to recycle accessories. 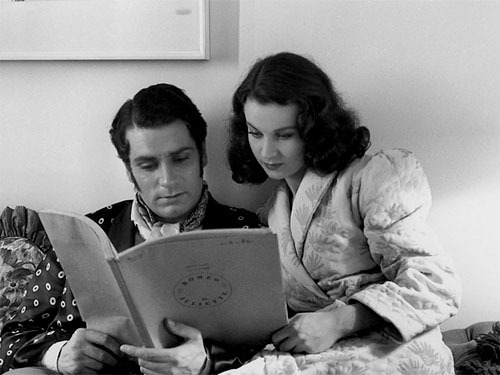 Click here for photos of Vivien Leigh and Laurence Olivier in fashion magazines. The Oliviers lived a high-class lifestyle: a cottage in Chelsea, a mansion near Oxford, Rolls Royces, fur coats, jewels, fashionable parties, holidays to Jamaica, New York, France, Italy, Spain. I don’t think the phrase “low key” would apply here. But their glamour extended beyond material possessions and wealth. They both had an impenetrable air of charm and charisma which enabled them to become stars of the first order. For Vivien, who hated being called “pretty” or “beautiful”, glamour was more than what a person wore. Glamour was a state of mind. 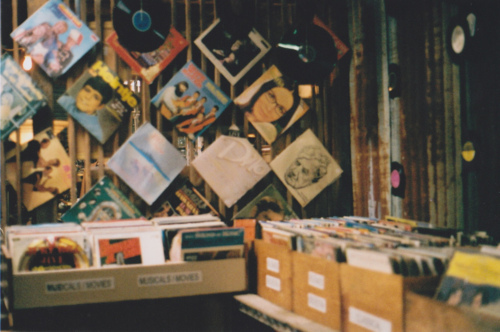 She had exceptional taste in art, music, fashion and interesting people. They were cultured and cultivated. For me, the Oliviers seem to have been in a completely different league from anyone we have in Hollywood today. Step aside, Brangelina. 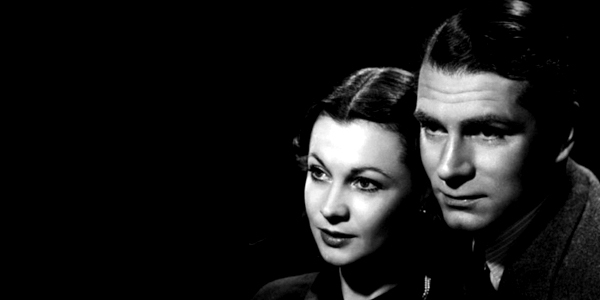 Vivien Leigh always maintained that she never wanted to be considered a film star. Being a film star was, in her opinion, “a false life lived for fake values and publicity.” Being an actress and being a film star were two completely different things. While this is true, Vivien was, indeed, a film star. Gone with the Wind secured her immortality as a star more than any other film she made, and while it was both her blessing and her curse during her lifetime, it ensured that she would never entirely slip under the radar. Much like his second wife, Laurence Olivier always detested acting in films. Maybe “detest” is too strong a word. He never really liked it very much. For Larry, theatre was the true actors’ medium while film was the directors’ medium. What he meant was actors had much more freedom to explore their parts and develop their performances on stage as opposed to having their performances edited together in the cutting room. Makes sense to me. But make no mistake, Larry was a formidable film star who has influenced many actors today. And hey, 10 acting Oscar nominations in a career ain’t bad. As mentioned earlier, The Oliviers preferred acting on stage to acting on film. Many British actors got their start on stage, but British theatre would certainly not be what it is today without the influence and trailblazing efforts of Laurence Olivier, and Laurence Olivier would not have been Laurence Olivier without some help from Vivien Leigh. From the beginning, Larry saw in Vivien a source of inspiration, and vice versa. He envisioned them being England’s answer to Alfred Lunt and Lynn Fontanne. Their beauty, determination, and strong work ethic helped them to solidify their positions as Theatre Royalty. Larry revolutionized the Old Vic when he co-managed with Ralph Richardson during WWII, and his dream of founding a National Theatre finally came true when he was appointed the RNT‘s first artistic director. There are many who say Vivien was not as strong on stage as she was on film, and prejudiced critics such as the dreaded Kenneth Tynan accused her of not being up to her husband’s standards. She was considered too beautiful to be truly talented. Yet despite critical misgivings, the public loved Vivien, and even after she and Larry divorced, her star power continued to draw in sell-out crowds for the rest of her life. Vivien Leigh and Laurence Olivier knew (in Vivien’s case) that there was a strong attraction (in Larry’s case) from the very beginning. It was practically love at first sight. Their love story rivaled that of any they played out on stage or screen. Seeing photos, reading stories about them, and reading some of the letters they wrote to one another, it’s enough to make any romantic swoon. They exemplified a loving and professional relationship for many of their colleagues. Although they both paid a high price for their wild abandonment that culminated in the destruction of their marriage, I find it impossible not to admire what they went through in the first place just to be together, and how they nurtured one another professionally throughout their 23 years together. It’s clear that they never quite got over one another in the end. “I’d rather have lived a short life with Larry,” Vivien Leigh told her journalist friend Radie Harris toward the end of her life, “than face a long one without him.” Many people yearn for a romance like that, but most never find it. 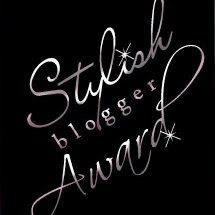 Carley from The Kitty Packard Pictorial has bestowed a Stylish Blogger Award upon vivandlarry.com! This came as a pleasant surprise because I only recently discovered the wonders of the Kitty Packard Pictorial during the fabulous blog-a-thon Carley hosted to honor Jean Harlow’s 100th birthday and the recent publication of Mark A. Viera’s new book Harlow in Hollywood. Carley is really knowledgeable about classic films and her blog is so fun to read! Definitely recommended. 1. I miss California. Don’t get me wrong, I love living in London and plan to stay here for a while after my programme, but the coming of spring makes me nostalgic for balmy weather and the beach (and legit Mexican food!). I also miss my cat Coco, but I know she’s happy living at my parents’ house. No matter where I may roam, I’ll always be a California girl at heart. 2010 was a pretty wild year with lots of life changes. I spent the first half in southern California and the second half up north and then in London! It was last January that I found out it’d been accepted to grad school, and now here I am about to start my second semester. It’s crazy. I miss California, especially the warm weather, my friends, and the beach, my cat and my family, but I’m loving being in England so much. I really feel like this was meant to be, like some strange force is pushing me toward my goals. I have a lot I want to accomplish in 2011, a good deal of which has to do with the subjects of this website. 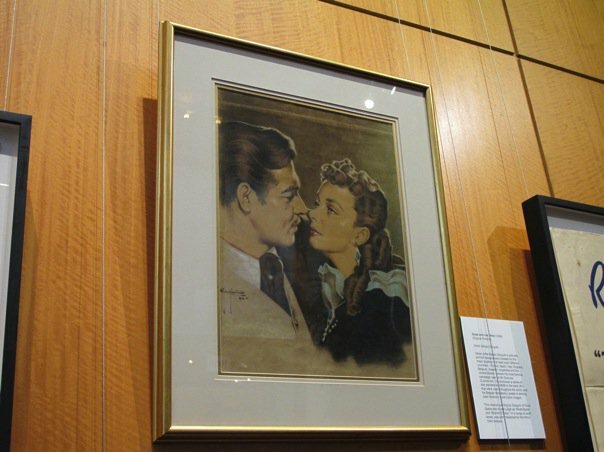 One of the cool things about pond hopping (and continuing with the location scouting theme from previous posts) is that I saw a lot of places where Vivien Leigh and Laurence Olivier lived, worked, played, etc, as well as exhibits and other things. So, to wrap things up for 2010, here are some photos I took this past year. I hope you all have a bright, joyful, and prosperous new year! Thanks for all of your amazing support in 2010!